Metal Casino, Ozzy Osbourne's gaming site for rock fans, is launching a twice-weekly gaming and music show streamed live on Twitch and YouTube. Metal Casino Live will fuse live casino experiences with hard rock and metal music. The first broadcastwill be this Friday, February 16 at 20:00 (CET). Ryan Roxie, who has collaborated with Alice Cooper and Slash, can’t wait for this week’s first episode. "It's gonna be awesome – we’re so excited to get started!" 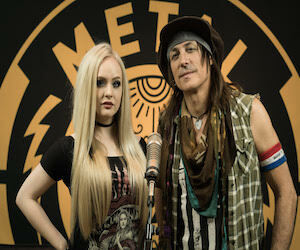 said Roxie, who has collaborated with Alice Cooper and Slash, "We're gonna have so much fun talking music and slots in the studio and with the viewers wherever they are and giving away great prizes." "You don't want to miss this. As we say at Metal Casino, 'Stay tuned, stay true and stay metal." The launch of the show comes after an awesome few months for Metal Casino, which went live in August and has been attracting music and gaming fans from all over the world ever since. Metal Casino offers big games and bigger attitude as well as the chance to win mega cash prizes and acquire exclusive tickets, backstage passes and merchandise from some of metal’s biggest stars. As well as partnering with Prince of Darkness and Black Sabbath legend Ozzy Osbourne, Metal Casino is also backed by Megadeth’s bassist David Ellefson. Metal Casino’s CMO, Clas Dahlen, says: “Metal Casino does things differently than our competitors and our hard rockin’ live show will reflect that. We are true, we’re real, we’re relevant and dedicated, there’s no bullsh*t. The show is about people from the metal scene enjoying themselves and enjoying casino games while interacting with the audience out there."